How is that even possible? Three words – volatile organic compounds (VOC). Basically VOCs are chemicals that are emitted from compounds that affect the body in various ways. VOCs can be natural compounds like essential oils or they can be synthetic compounds like fragrance. The levels of VOCs inside the home are generally 2-5 times greater than those outdoors. You can learn more about VOCs and what they do to the body in this article. Since most detergents and fabric softeners contain fragrance, it is very likely that the types of fragrance used in these products is stronger and more volatile than fragrance-free or natural detergents. This means that each time you inhale one of their “fresh scents” you are getting a bunch of VOC exposure as well. Instead of choosing to buy one of these products, I decided to find a more natural way to keep my clothes smelling fresh. 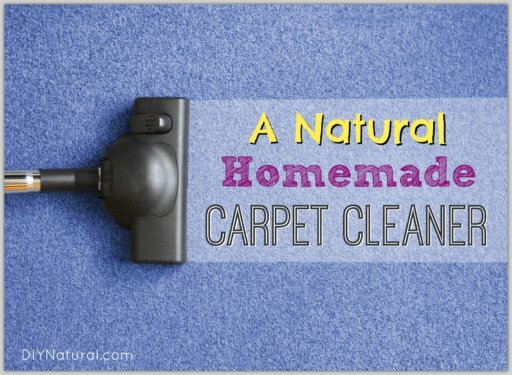 Now, I can’t guarantee that this recipe will work as long or be as strong as commercial products (since it doesn’t contain chemicals), but it does leave drawers and closets smelling fresh. I’m going to tell you a secret….this is the easiest DIY ever! This basic recipe is just two ingredients. That’s it! Even better, it will take you so little time to make that you probably won’t even believe it. One last perk – it’s reusable and customizable. You can make it whatever shape, scent, or size you’d like. 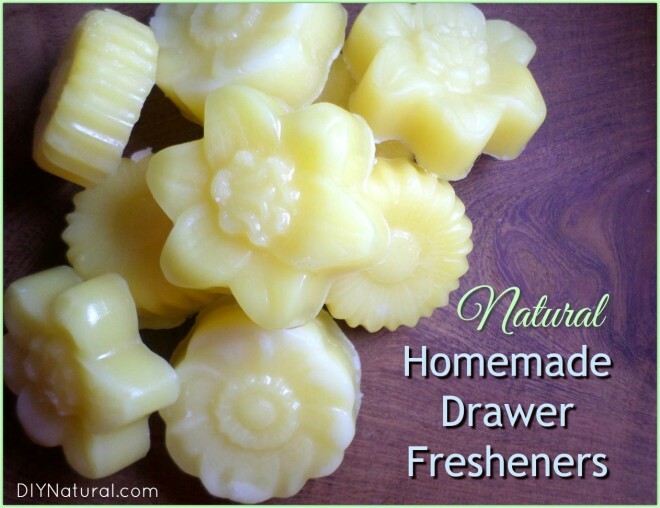 How are these homemade drawer fresheners made? With beeswax, of course! Natural beeswax has a very sweet, honey-like scent. Its natural scent is very subtle, so I decided to add essential oils to my beeswax to give it a little more scent. I chose to make two different sets of drawer fresheners: one for my own drawers and one for my husband’s. For my drawers, I chose to use a mixture of grapefruit and mandarin essential oils. I’m a fan of the light, bright, and fruity scents, but they do evaporate much more quickly than floral or herbal essential oils. However, when placed in closed drawers, these citrus essential oils tend not to evaporate so quickly. For my husband’s drawers, I chose to use scotch pine essential oil. This oil is very manly and smells just like you would expect from pine needles. The scent is stronger than citrus oils and tends to freshen drawers a little longer. I also notice that it seems to scent his clothes a little more. If you have another essential oil you are more fond of, you can easily substitute it in the recipe. I’d recommend using no more than 30 drops in each individual drawer freshener or else your beeswax might become soft. This recipe made ten half-ounce beeswax drawer fresheners. I made two batches of these, which left me with some extras that I used throughout the house. See all the other ways I used them below the recipe. 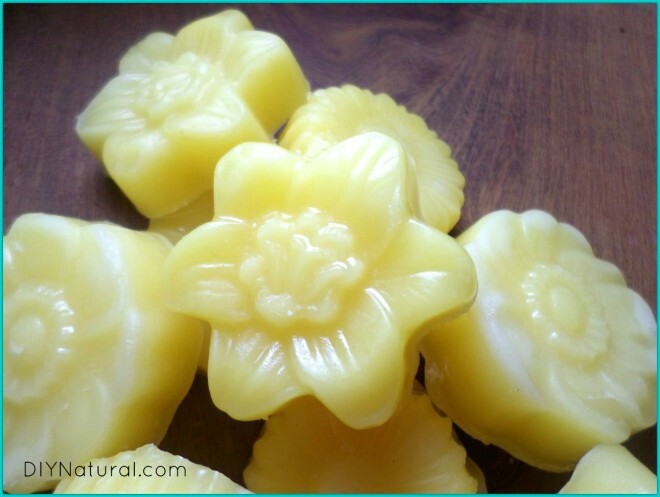 Add essential oils to your molds while beeswax is melting. Pour melted beeswax into molds. Allow to cool. I put mine in the freezer to make it easier to remove drawer fresheners from molds. Place in jute or cotton sachets (to protect drawers and clothing from wax/oil stains). Change every month or as needed. Remember: These are reusable! Once the scent is gone simply chop or grate down the beeswax, melt, and start over. Bathroom fresheners: Simply add a few to a decorative bowl and place on bathroom counter/sink. Home decor: There are unlimited amounts of shapes and molds, and these look amazing in mason jars or as table decorations. Party favors: From bridal showers, baby showers, to birthday parties and beyond, these make adorable take home gifts. Car fresheners: Take 1-2 of these and place them in jute or cotton sachets and put them in the cup holders of your car. As they heat, they will release even more scent. Can you think of another use that I missed? If so, let me know in the comments below! So am I reading correctly, 20 drops of EO in EACH individual mold? Thought it could be easier to mix the oils into the beeswax and then pour out into the molds. That’s correct, Kim – 20 drops in each individual mold. You can also mix the oils in with the beeswax, but since I did two different scents at one time, I mixed the oils in the mold first. I LOVE this idea! I can’t wait to get started! One question though. Putting them in a car could be quite messy on a hot day. Would putting them in a cup before putting them in the cup holder work ok? Absolutely, Deb. Great idea! A cup would protect car surfaces from melted beeswax just fine. Love this idea. What one for the kitchen pantry. Maybe use bayleaves. I keep bay leaves scattered in my pantry to repel moths and it works beautifully. Great idea! You could also use Bay essential oil, Suky. Or you could place the bay leaf at the bottom of the mold and pour the beeswax overtop. 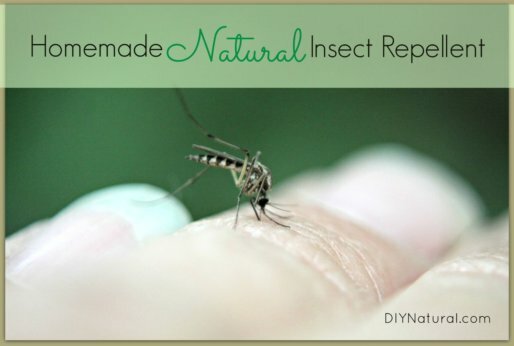 I think I will try this with repellant oils for bugs and critters as well as using for keeping clothing fresh. I’m going to be busy this weekend! I’m excited about making some to sit out, too! Whoo hoo! Thank you for giving a link about VOCs. It’s always helpful to have references for further reading. Great ideas, Carla!! Happy DIYing! What is the benefit of beeswax, can I use only essential oil ? If you try making this recipe without beeswax, you’ll just be putting essential oils into the drawers by themselves. Essential oils can stain clothes and soak into the wood of drawers, so it is much better to pair them with hard beeswax. The beeswax allows the scent of the oils to freshen drawers while looking decorative and holding shape. Hi! I don’t have silicone molds that would work for this… What could I use as a mold instead? When you pour the beeswax, it will be quite hot (around 145 degrees Fahrenheit). Molds for candle making, soap making, and candy making will work just fine. You can also try using ice cube trays, but it might be hard to pop the drawer fresheners out (sticking them in the freezer should help).